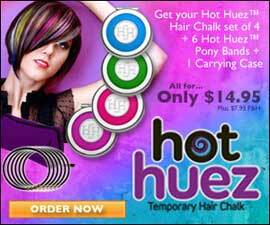 Hot Huez Hair Chalk is the hot new hair craze that allows you to instantly change your look with eye-popping color! Hot Huez Hair Chalk is fast, easy and washes right out with your shampoo. So whether it’s for a rocking day or a special night, Hot Huez Hair Chalk is instant glamorous fun just for you. Just choose your hue, slide along hair and color goes on.